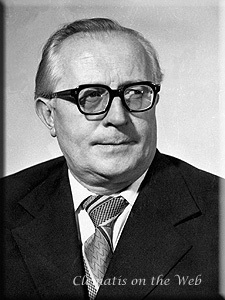 Mikhail Ivanovich Orlov was born in 1918. He graduated from the Forest-Technical Academy in Leningrad and later, in 1963, was awarded a doctorate. Working at the Central Botanical Gardens in Kiev, he instigated a breeding programme with the object of raising clematis cultivars resistant to wilt. It is reported that each year some 1500-2000 seedlings were raised of which only one or two would satisfy his requirements. This programme was carried on by his successor at the gardens, Y A Voichenko. Orlov developed some 40 hybrids for commercial distribution, many of which remain relatively unknown in the West, and authored more than 40 scientific works. He died in September 2000, aged 81. Based in part on an obituary by Ian Lang and John Maskelyne in Clematis International 2001 by permission.